Item #1. Transporting Daylilies For Exhibition. Item #2. Preparing to Exhibit Daylilies. Item #3. Staging an Exhibition Show. The American Hemerocallis Society mission statement includes the desire to provide the general public with education and exposure to the daylily. To help with this mission, members and local daylily groups choose to host a daylily exhibition show and are proud to have their daylilies on display for the public’s viewing pleasure. You certainly are breathless and taken by the beauty of the display! Welcome to the wonderfully addictive world of hybrid daylilies! Although the show is somewhat an artificial environment for our favorite flower, it is our desire that you would see the diversity and initial appeal of the daylily at the show. Exhibitors chose forms, shapes, sizes and colors to expose you to some of the near 75,000 different registered varieties on the market today. Many of these plants are available for purchase from growers in the local clubs, from regional sources or on the Internet. Many members would also love to have you as a visitor in their gardens, where you can see hundreds of other cultivars! Anyone can enter flowers in these shows. You do not need to be a member of the local club or the AHS to enter. However, in order to win an AHS rosette, you must be an AHS member, and you will be allowed to join at that time if you happen to win! You will most likely see LOTS of ribbons awarded to the exhibits. Using the official AHS Scale of Points and judging standards, exhibits winning yellow ribbons scored at least 80 out of 100 points. Red ribbons scored at least 85 points, while blue ribbons scored at least 90 points. Purple ribbon recipients scored 95 points out of 100! Photographs and questions are allowed and encouraged. Most exhibitors and even judges are on site today to answer your questions and help you understand what is going on. WARNING: this is an addicting hobby! Collecting daylilies, hybridizing daylilies and showing daylilies has proven to take over the lives of more than one gardener! HOW ARE THE FLOWERS ORGANIZED? If the show you are visiting is a “display only” show and not accredited by AHS, the sections may be a bit different, but they should generally organized by size or form. 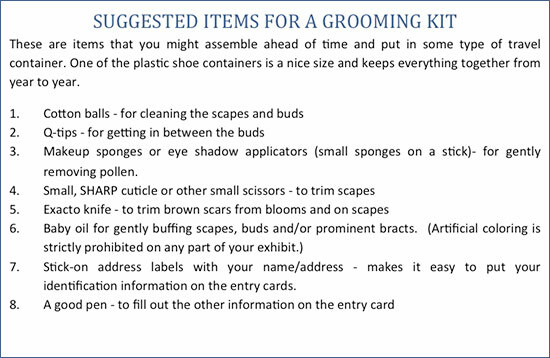 In an accredited show, the required on-scape sections are as follows, and the registration data on file with the AHS at – http://www.daylilies.org/DaylilyDB/ is used to determine placement of the exhibits. The “Schedule” of the show is the law. In this Schedule, all rules, standards and procedures are clearly outlined for exhibitors. Ask for a copy of the Schedule if you visit a show. Study it. Knowing HOW the show is set up and HOW the entries are judged is the key to successful exhibiting. You may download a sample Schedule here: <-- click to download Word file. All of the flowers you see with ribbons on them in an AHS-accredited show were judged by trained and certified AHS exhibition judges using the AHS scale of points. Please ask for a show schedule from any member or at the membership table for more information on judging and the scale of points. Some clubs choose to not be accredited, and can outline their own judging procedures and policies. For example, some clubs have smaller events that are judged solely by public vote! In an accredited show, the judging panel should be made up of at least three people and the majority of the panel must hold senior status. Judges for AHS Exhibition Shows must be a member of AHS for at least three years and must attend special classes organized by AHS. It is the intention of the judges to judge each exhibit against its registered standard and against other scapes of the same cultivar shown in the event. Judges also try to provide feedback to exhibitors. If you bring scapes to the show, please take the opportunity to talk to the panels of judges about your scores. You will learn much about standards, registrations and also grooming and selecting scapes for exhibition. Decide how you will transport these scapes to the show location. You may be limited to how many you can exhibit by the transportation method you choose. Build a contraption that will FIT INTO YOUR CAR, INCLUDING SCAPE HEIGHT and is light enough to carry. In these few days before the show, keep your garden deadheaded in order to make sure spent blooms do not interfere with new ones opening. Look for scapes that are straight and close to registered height. Select scapes that have little insect damage, or have damage that you can clean off. Look at the show schedule to see when classification times start and stop. Plan to arrive during this time. Inevitably, 90% of entries are made in the last 30 minutes, so plan accordingly to get your flowers to classification in time. Fill out your tags with your name and address on both parts of the tag. Get the Official Show Schedule and figure out which sections the flowers you will be showing fit in to. DO NOT USE EUREKA for measurements. The AHS database, checklists or CD-ROM are the only acceptable sources for accredited shows. Don’t select more daylilies than you can groom in time for the show. Don’t select so many daylilies that they will be crammed in your transporting device and ruin each other on the way to the show. Remember the large flower section is usually the one with the most flowers, so try to pick flowers from other sections, too. Do as much grooming as you can at home. The show location is crazy. Vases and extra tags if needed will be provided at the show location. Pick some single blooms as well as scapes to bring to the show for display. Groom before you get to the show location. Space and time are limited! Go over the entire scape with a damp cotton ball. Freshen up the bud scars where previous blooms have been by taking your Exacto knife and trimming the first layer of tissue. Brush off any pollen that has fallen off on the petals or sepals with your makeup sponge. The idea is to make everything appear green. Trim the brown of bracts off to a point. If a flower doesn’t want to open all the way you can hit it lightly with the air from a hair dryer set on low. Things you don’t want on your scape are open flowers on the scape that overlap, a bud interfering with the opening of a bloom, a torn petal, bug droppings or spider webs, and of course no brown. Do not remove pollen or anthers on an exhibit bloom. Nothing below the vase lip is judged, so don’t waste your time grooming to perfection there! Remove seedpods and spent blooms. Remove buds or other open flowers that distract from the best blooms on the scape. Grooming is the area some judges hit hardest. A beautiful entry that is poorly groomed hardly ever wins. Build a contraption to allow you to transport your scapes to the show location. Keep your scapes from touching on the way to the show. Pollen can stain and ruin a winning bloom! Once you get to the show, if you haven’t already, you will be given an entry tag and a vase to display the scape. Confirm with the show schedule if other arrangements are in order; each show is a bit different, and the show schedule tells you EXACTLY how things will go. If you arrive at the show with your entries and don’t know which section your daylilies will be shown in, that’s time-consuming and not recommended, but acceptable. The Classification volunteers will help with this information. Once your entry has a tag and is confirmed by Classification volunteers, it will be out of your hands. At this time, make sure the scape is standing straight and proportional in the vase (cotton balls or foam placed below the lip of the vase may help with this). The Placement volunteers will take your entry from classification and place it on the proper table for judging. Now you wait for the results and enjoy the show! By exhibiting, you will have connected with the club, you will have connected to the national organization, and you will have connected with other daylily fans like yourself. "I don't want to cut/waste a whole scape to bring it to the show." That's a common feeling. If it’s a new cultivar, or its one you are using for hybridizing, then don’t cut it. But, on a clump that is surely going to produce multiple scapes, you won’t miss one - I promise. The feeling of contributing to the public education of daylilies is much greater. There are over 70,000 registered daylilies. You have plenty that no one has ever seen before. Cut one, clean it up and bring it in. Once you try it, you will wonder why you never did it more in the past. "I don't need a 'judge' telling me my flowers are pretty. I can see that for myself." Exhibiting daylilies isn't about the 'prettiest' flower, it is about STANDARDS. Judges look for traits such as scape height, flower texture, flower substance, grooming, flower color, flower size, growing conditions, etc. Pretty only goes so far. Judges are judging on a defined set of criteria for each individual flower. The standard the judge’s use is the hybridizers registration information. For example: EL DESPERADO is registered at a certain size. If an exhibit is shown growing smaller than the registered size, points are deducted. If it is registered as a bright yellow and is shown as a muddy cream, points are deducted, etc. Remember, the judges aren’t judging YOU, they are judging flowers to the registered standard. That's okay. The mission of an accredited American Hemerocallis Society Exhibition Show is PUBLIC EDUCATION - not competition. There are only about 70 shows held each year and being a part of that is a great thing. Not too many clubs can say they hold an accredited show. More information on hosting a show can be found here. Year, cost or hybridizer does not matter in exhibition shows. The average year of introduction for section winners in the last decade is 1988. Any daylily can win. © Copyright 2013, by The American Hemerocallis Society, Inc.